The Christmas events source talented makers and designers from all over the UK and bring together these small individual firms producing top quality products under one roof at two venues around the UK. Kent Christmas Fair and Loseley House Christmas Fair offers a unique opportunity to find special presents for special people, the perfect place to work your way enjoyably through your Christmas list. New products and ideas are a feature of each event. Indulge yourself, your family and friends with stunning fashions and accessories, leather bags and belts, dazzling jewellery from sparkly fashion to graceful diamonds, lustrous velvets and satins in scarves and luxurious soaps and skincare. Celebrate the festive season and entertain in style. Decorate your home and table with elegant candles, platters and bowls and tasty treats. Visit the Specialist Food area, which is brimming with scrumptious cakes, wines, cheeses and meats. Add that extra spice with olives, dips, chutneys and preserves. Fill your festive Christmas cupboard with delicious delights. Pleasurable Christmas shopping, easy parking, free cloakrooms for coats and heavy shopping, wide aisles with easy access for wheelchairs and pushchairs. IMPORTANT INFORMATION – CRAFTS FOR CHRISTMAS, YORKSHIRE. It is with great sadness that after 30+ years of coming to Yorkshire we have to announce that we will not be staging the event this year. We have enjoyed coming to Yorkshire and would like to take this opportunity to thank everyone who has attended over past years. 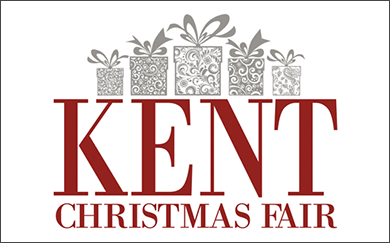 The ever-popular Kent Christmas Fair is returning again to the Maidstone Exhibition Hall, Kent Event Centre, Kent County Showground on the 2nd, 3rd, and 4th November. The Kent Christmas Fair offers a unique and exciting event with up to 100 craftsmen and women showing their natural creative talents and enthusiasm in a vast range of inspirational gifts. The specialist food piazza will delight the taste buds with cheeses, chutneys, pies, coffee and confectionary all made to the highest standards. New for this year from Bearsted, Annabelle Jane Cake School will be presenting workshops and demonstrations of sugarcraft and cake decoration alongside their well-stocked pop-up shop. Refreshments from Kentish caterer Azra available all day with meals, lite-bites and fabulous cakes. 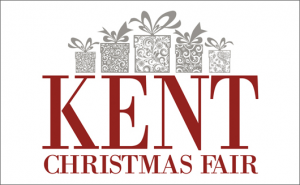 The advance ticket feature for the Kent Christmas Fair 2018 is now closed. The ever popular Loseley House Christmas Fair is returning again to the Tithe Barn and Special Pavilions, on the 15th, 16th, 17th and 18th November. 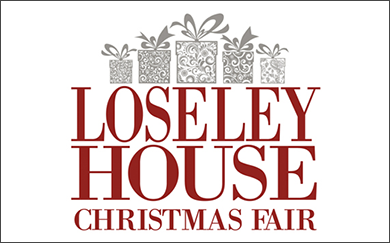 The Loseley House Christmas Fair offers a unique, exciting event your customers and visitors will really enjoy. The Rural Crafts Association presents up to 80 craftsmen and women showing their natural creative talents and enthusiasm in a vast range of inspirational gifts. Refreshments available all ay from Caper and Berry, delicious cakes, tea and coffee, lite bites and mulled wine an ideal way to take a break and work out the Christmas list. The event is floored and carpeted with easy access for wheelchairs and pushchairs. There is ramp into the event and ramps into the Tithe Barn, if you need assistance please ask – we are very happy to help. Disabled parking is at the front of the main car park area. Please note that dogs are only allowed in the car park and only on leads. The advance ticket feature for the Loseley House Christmas Fair 2018 is now closed. 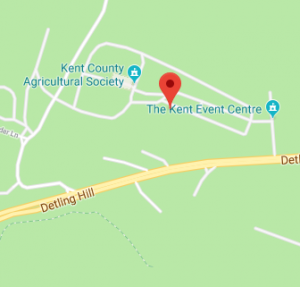 The Kent Event Centre at the Kent Showground is ideally suited for arrival by car. It is located on the A249 which is a busy dual carriageway. From the M20 Motorway. Exit the motorway at junction 7 and follow signs to Sittingbourne and Sheerness A249. The Kent Showground is clearly marked and is approximately 2 miles from the junction. From the M2 Motorway. Exit the motorway at junction 5, signposted Maidstone A249. The Kent Showground is approximately 5 miles from the junction. The postcode is ME14 3JF. Please note that it is best to follow the signs as you near the Showground rather than a sat nav. By Bus – From Maidstone Town Centre Chequers Bus Station to Detling Kent County Showground there are two bus numbers 333 and 334 but please contact your local bus company direct or go on-line for correct times. By Rail – The nearest train station is Maidstone East. For more rail enquiries telephone: 08457 484950. The Channel Tunnel is within a 40 minute drive (35 miles). Ashford International is a 20 minute drive (20 miles). Loseley Park is South of Guildford and 30 miles South West of London. By road Loseley Park is situated on the B3000 New Pond Road and the main entrance is in Stakescorner Road, signposted ‘Loseley House’. Please be aware the Sandy Lane route has a sharp hairpin bend not suitable for coaches. If using SATNAV, please enter “Stakescorner Road GU3 1HS“ otherwise you will be directed to the wrong part of Loseley Estate. From Guildford Bus Station – numbers 42, 70, 71 and 72. Buses will take you to the end of the Loseley drive – it’s then a pleasant walk of a little over a mile to Loseley House. 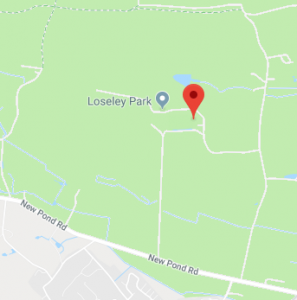 Our nearest main station is at Guildford around three miles away and a taxi from there will take you direct to Loselely Park. Alternatively the bus station is a short walk and the bus will take you to the end of the Loseley drive – it’s then a pleasant walk of a little over a mile to Loseley House.